This is one of the most phenomenal discoveries of the century. I am still in a state of shock and (g)nashing my teeth for previously entertaining doubts about Q. For full details of the discovery follow the link to the original article. I give the opening section below. Would like to read the entire article but when I click on the link I get a Bad Gateway or Database error. Yep. Maybe more traffic than that kind of site can bear. I am a new reader. My first reaction after reading the title was, "What?" Good thing I read the addendum! I suspect the ligurgy.co.nz server is getting hammered today. Did the article say where the fragment was found? Very interesting. I wonder if this joke will take on a life of its own and we'll be explaining to people 20 years form now that no it wasn't actually discovered, back in the early 21st century people still had a sense of humor. We will have Flat Earth proponents quoting it from here to eternity ! One would presume that the clamour of people attempting to access the article has overloaded the website somewhat, causing the database error. I'm afraid I've also never heard of literby.co.nz. I'm surprised no one else seems to have posted about this discovery of Q today as well, if what the article snippet says is true about the cooperation between archaeologists/scholars/Israeli authorities. The papyrus in the picture is the Nash Papyrus. So yeah, April Fools. Just caught the "(g)nashing" reference. Nice. How about that religious folks haveva sense of humor! Scholars found Q a long time ago. It's called the Gospel of Matthew. If that is Q, then they also found copies of JEDP. One joke at a time, please. Posted 31 March 10pm .... Grenwich Mean Time, perhaps? Look familiar? Faux story. Funny how those who oppose the Bible have to make stuff up. Maybe 1st century Mark fragment will be published on next April 1. Good job, Peter. I am not saying you should try comedy writing as a career yet--SNL probably doesn't need you right at this moment--but good job. Love it when scholars have a sense of humor! Well done! Sorry to be that guy, but this is most likely a hoax. The image here is of the Nash Papyrus. Which features the Ten Commandments rather than the Q source. 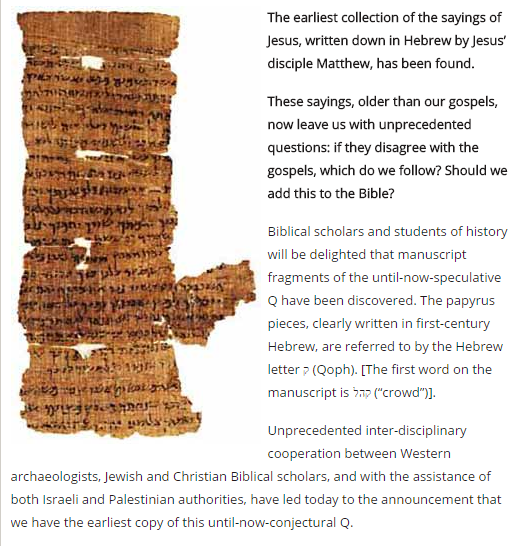 I´m so surprised that in this web page publishind and article without a reaction from the editor, do you believe that this document is q because has a title in hebrew with the letter qof at the beginnig? PS: you taught me a class in OCCA. I for one, do not find this funny. It plays a part in the casting of doubts and shadows in one's faith. Depending on how true this is, it would seem to confirm what early Church writers, Eusebius,Ireneus, & Papiaus have noted. Matthew wrote in "Hebrew letters". I have long held that a complete copy of not only Q, but also M and L (from the four-source hypothesis) exists in a well-established compilation format within the Greek NT itself. But seriously, John de Lancie many years ago dealt with the entire Q Continuum, so April 1 or not, that issue was already secured long ago. This is not the Q source! This is a second century BCE manuscript fragment containing the Ten Commandments and the Shema. This was an april's fools joke. It was interesting seeing what sort of reactions an announcement like that would cause. I only stumbled across this today since i haven't been following things of late and enjoyed the joke. There are many scholars here .... I am just a lay man ... I find such thing a very reckless and sick joke.... there are people who sacrificed their lives because the believed in the Scriptures.... such do not have the luxuries of making stupid sick jokes.... I guess a lot of people in the scholarly world are so full of knowledge but perhaps lacked education!!!!! many people have sacrificed their lives eating too much pizza. If a person feels like doing themselves in coz of fables written so long ago by uneducated nomads, it must be the nomad's fault for not warning about excess pizza consumption. Looking forward to next month's breaking announcement. I expect it will probably be something about a first century ms of Mark being found tucked away in the inside breast pocket of Bruce Metzger's funeral suit when his coffin is exhumed on April 1st. I think that a serious website like this should not publish this kind of joke given the sad fact that there are many confused laypeople out there who are bombarded with "non scientific bogus info". We can laugh about it but those who already have all kinds of conspiracies theories about manuscript traditions and tetxtcriticism it is bo laughing matter. Normally I am in for a joke in the right forum in the right place. With internet distribution I am sure somewhere, this is being sited as fact.